Ashton Kutcher’s Twitter Account Hacked By Geek Activist ! 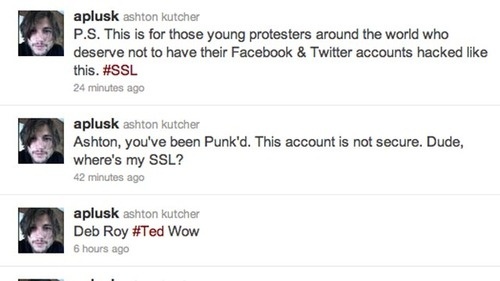 Hey, look: Ashton Kutcher’s Twitter account was hacked in the name of Internet justice. Someone broke into his account and tweeted the messages above. Judging from their message, they probably used the notorious “Firesheep” application, which makes it easy for anyone to hijack other people’s unsecured browsing sessions over wi-fi. The point the mysterious hacker(s) was making is that many of our favourite web applications, like Twitter, don’t use high-security “SSL” encryption to protect their data. This makes it easier for people to snoop on users for nefarious means, like cracking down on Internet activists. Facebook recently enabled SSL, to the praise of human rights advocates and consumer groups.